Home / Archive by Category "Simply Residential News"
The middle of the month rolls around. 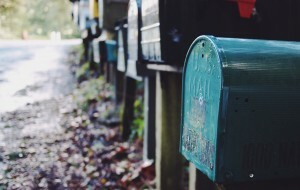 You lace up your best running shoes, you stretch, and then sprint to mailbox in hopes of finding this month’s issue of Simply Residential Property Management magazine. It’s been a solid monthly workout for you. You really had your heart rate going. But beginning this spring you’ll need to diversify your exercise regimen. It’s true, our magazine will be moving from a monthly publication to a quarterly publication. Twelve magazine issues per year will become four magazine issues per year. The magazine will print each June, September, December and March. This change will allow our publication’s content to align with the seasonal nature of the industry. Don’t worry. You’ll receive the same great content you’re used to! We’ll continue to provide updates on the national and local Twin Cities rental and real estate markets. We’ll also have helpful landlord tips regarding maintenance, legal issues and more. Make sure to check out our website blog for relevant information. Visiting our website doesn’t even require your sneakers! As first quarter 2016 (Jan, Feb, Mar) came to a close, it was clear that early 2016 has been strong for both landlords and home sellers. 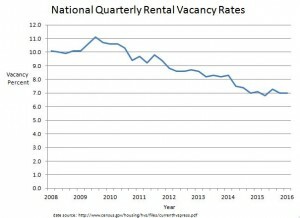 Vacancy rate is the percentage of unoccupied or vacant rentals of the total number of rentals in a designated market. It’s a common metric to measure the strength of the rental market. The U.S. Census Bureau reports that the national rental vacancy rate closed at 7.0% for 1Q 2016. That rate has stayed fairly consistent over the past year, but the blue graph to the right shows how low the monthly vacancy rate is compared to the past seven years. So, what does a low vacancy rate mean for investment property owners? When vacancy rates are low, rent prices rise as tenants scramble to find properties. 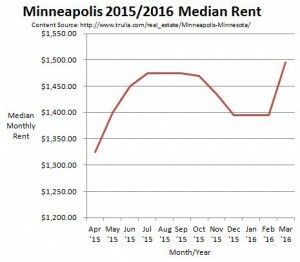 The red graph to the right shows that March 2016 had the highest median monthly rent in Minneapolis over the past 12 months. Simply Residential used those statistics to justify recommendations of rental rate increases for a number of our properties during 1Q 2016. Low vacancy rates also mean rentals are on the market for less time. We saw this firsthand last month, as 1/3 of our March new lease signings occurred within a week of being marketed. As job and wage growth slowly drive the country’s recovery from the recession, we’re seeing a renewed consumer confidence. Couple the interested buyers with a low inventory of homes for sale and we have a seller’s market. 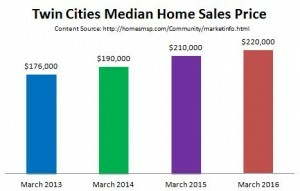 Homesmsp.com reports that there was a 20.6% decrease in Twin Cities homes on the market in March 2016 compared to March of last year. The multi-colored graph to the right shows how much higher the median sales price was in March 2016 compared to March in previous years. If you’re considering selling your investment property, please speak with us. Along with providing rental property management services, our on-staff licensed real estate agent and broker are happy to provide you a comparable market analysis (CMA) so you can properly consider the options of renting and selling your property. Also, know that we offer special real estate service pricing to our current property management clients. Whether you’re renting or selling, Simply Residential Property Management’s leasing and sales team has you covered. The first quarter results from 2016 show that both the property rental and home sales markets are very strong. Simply Residential will continue to monitor important factors including the interest rate and the local vacancy rate. But it’s clear that now is a fabulous time to rent out or sell property. May is Military Appreciation Month. Along with honoring our military throughout the month, there are three dates in particular that need to be recognized. First recognized by President Ronald Reagan in 1984, Military Spouse Day is an opportunity to recognize the level of support and important sacrifices made by veteran spouses. 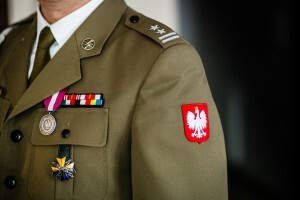 Recognized near the end of Armed Forces Week, the observance was first celebrated in 1950. The day is meant to honor all five branches of the U.S. military- Army, Navy, Marine Corps, Air Force, and Coast Guard. As a federal holiday to mark the remembrance of those who died serving our country, Memorial Day is the final Monday of May and originated as Decoration Day in 1868 following the country’s Civil War. 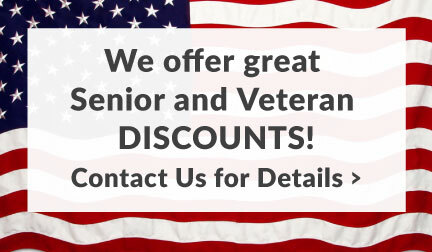 Simply Residential thanks our veterans and their families for their service and support. They have given more for our country than we can comprehend. As you may know, we’ve been conducting some over-the-phone and online surveys with our clients. In the process, we’ve heard several times that the accounting statements we send out aren’t easy to read or understand. In order to make it easier for everyone to access the information they need, we provide you with a cheat sheet of information to help make the statements easier to digest. When Mona sends out your statements each month, she also attaches a PDF of the essential numbers for you to review. Look for it in your next accounting email! The statements that are automatically generated into your owner portal contain any and all information you could possibly need each month. Because of this, they tend to be a bit redundant and ‘accounting-y’. The first 5 lines are the most critical for an at-a-glance understanding of your account, and the bottom numbers are simply explaining those top rows in more detail. If you still have questions, contact Mona at accounting@simplyres.com! investors. As we say quite frequently, we have a wide variety of financial professionals, including some awesome CPAs, that we’re happy to recommend. If you’re curious about which of these deductions apply to you, let us know! If we don’t know the answer, we’ll connect you with someone you can trust to walk you through it! Ready to learn more? Call us today at 952.893.9900 or email Amanda at amanda@simplyres.com. Fall Is Here, Are You Ready? Is your rental property ready for fall? As summer comes to an end, Minnesotans begin the process of preparing for the fall and winter seasons. Much of that preparation involves buying new back-to-school clothes, sealing up the windows, and making sure that all hats, coats and other winter gear are up to snuff. With all that preparation, homeowners often overlook the needs of their home due to the changing weather. For example, while changing leaves are stunning for sight-seeing, they’re an absolute nightmare for your gutters. 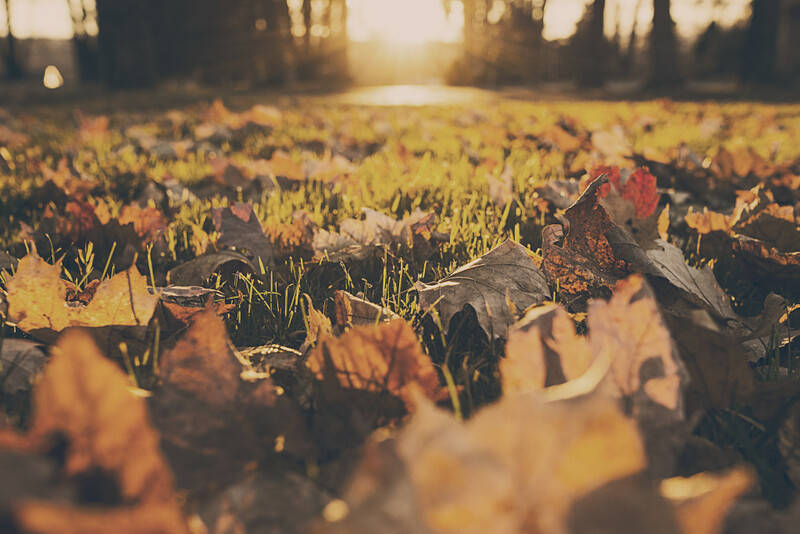 If you have a rental property, the last thing you’re going to want to do is come home from watching the changing colors to clean dead leaves out of the gutters. 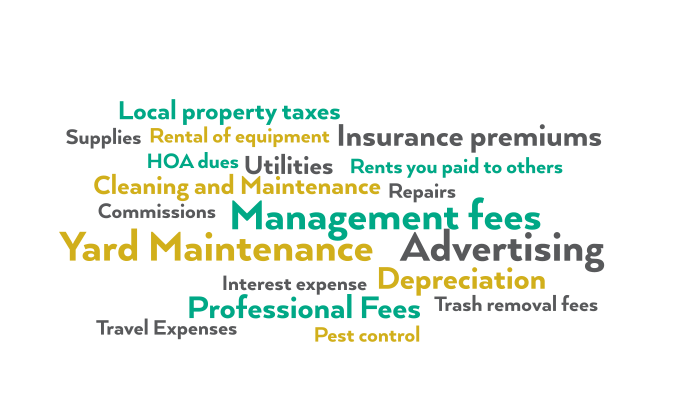 Luckily, when you work with Simply Residential Property Management, these things don’t need to be a concern. We offer this service at a nominal charge as part of our maintenance services. Along with cleaning your gutters, it’s also necessary to blow out your sprinkler system. While it isn’t necessarily a difficult task, it can certainly be a burden to take the time out of your day to do this amidst all of the back to school hubbub. Are you going to want to take a day off of work to take care of this? In our experience, it’s easier and more effective for us to perform this service for our clients. After all, what is your time worth? Lastly, it’s important to remember to check your furnace before the cold weather sets in. Unlike your air conditioner, you can check your furnace at any time and at any temperature. Don’t get caught off guard and end up with cold and angry tenants! We offer this service to our clients on a yearly basis to ensure they’re always ready for the season. You can have any of these services on their own, or we can do an annual maintenance walk-through to help you get a better understanding of what maintenance issues may come up in the next year. As we say goodbye to summer and usher in a beautiful Minnesota fall, don’t forget to consider the special needs of your rental property. If you’d like us to take these tasks off of your plate, give us a call: 952-893-9900! New Monthly Magazine! Our monthly magazine is created with the intent to educate our clients and partners about industry related information and trends. Customer Satisfaction Surveys! We know we can’t be the best-in class property management company without your feedback! Expect to see a survey upon completion of all maintenance related work orders as well as twice during the lease cycle. The input from you via surveys ensures our ability to continually deliver top-notch service. Complimentary Preventative Maintenance Walk-Through! In an effort to keep your property up-to-date, our Maintenance Team performed a review of your property early this year. This review resulted in a report back to you with recommendations on maintenance and updates that should be done right away or at some point over the next 12 months. Our goal is to help prepare you with a plan for repairs/updates over the next year versus having to worry about maintenance costs all at once. We’e being proactive, instead of reactive. Increased Rents! Over the last seven years our economy has realized many ups and downs leaving many owners reluctant to raise rents for fear of losing a tenant. In the past year, we have focused on bringing all properties to fair market with great results. In completing a full market analysis on all properties that are due for renewal, we have raised rents anywhere from $50 to $300 per month. This focus has increased cash flow and profitability for many of our clients. We foresee more opportunity with this in the coming year. team. I’m proud of each employee as they all work diligently to help provide best-in-class service day in and day out. Our upcoming magazines will introduce each one of our team members so, be sure to watch for that in the months to come! I personally appreciate your business and the opportunity to serve your property management needs. If you want to stay up to date with the property management industry, our magazine will provide a higher level of communication with regards to new services, seasonal nuances, market conditions and trends. Subscribe here today! If you have questions about your rental property, or want to learn more about the additional services we provide for our clients, call me and let’s chat: 952-831-5300.